American-style food and music memorabilia in Lyon’s Presqu’île. Hard Rock Cafe brings its classic American-style culture of burgers, drinks and music to Lyon’s Presqu’ile : a restaurant, two bars, outdoor terrace, small music venue and gift shop in a huge building close to the Rhone.A pair of Elton Johns glasses, one of David Bowies shirts and a leather jacket previously owned by Lou Reed are just a few of the rock and roll artefacts on display. What is Hard Rock Café? Hard Rock Cafe Inc. is a large international chain of theme restaurants founded in London in 1971 by Americans Issac Tigrett and Peter Morton. A few years later in 1979, Eric Clapton, a regular at the Piccadilly Circus Hard Rock Cafe, donated a guitar, wishing it to be hung on the wall above his favourite seat which then prompted Pete Townsend to also donate a guitar and the practice of decorating the walls with rock and roll memorabilia soon spread, coming to identify the chain of burger bars. The company now owns over 80,000 items of rock and roll memorabilia making it the largest private collection in the world. In the 1980s the company was sold to Seminole Tribe of Florida in 2007 and has its main headquarters in Orlando Florida. At last count there were around 191 Hard Rock Café locations distributed throughout 59 countries, including 168 cafes, 23 hotels and 11 casinos. 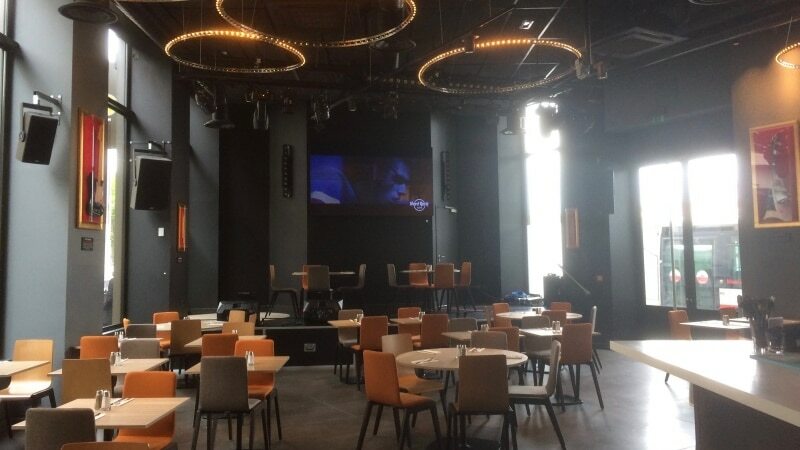 Franchise owners Mathieu Cochard and Thibault Salvat invested around 4 million euros to open the Hard Rock Cafe Lyon in November 2016. The place offers typical American cuisine including established standards such as nachos, chicken wings and spinach and artichoke dip followed by main courses which include fajitas, burgers, smoked ribs and barbecued chicken. They make an effort to include some local specialities such as local breads and each month a burger designed by a local chef. 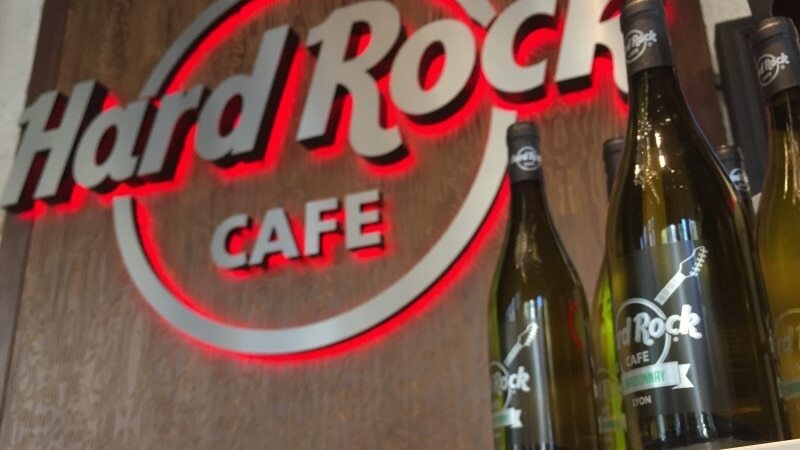 It is also the only Hard Rock Cafe in the world to sell its own wine (made by Collovray & Terrier, from Macon, Burgundy, who also designed the wine menu) . With side dishes of cowboy beans and coleslaw and a hot fudge brownie for dessert you might just forget you’re in France. The bar area is huge and perfect for any cocktail you might fancy and there’s even Hard Rock Cafe Beer. A selection of French wines are available if you’re thirsty for something a little more regional. There’s a kids menu too so it’s great for all the family. 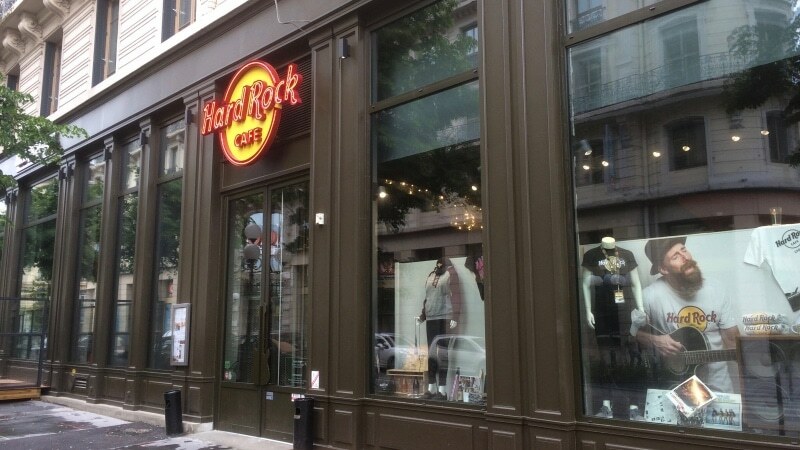 Hard Rock Café Lyon is located between Place Bellecour and Place des Terreaux in the Grolée neighbourhood of the Presqu’ile on the banks of the Rhone a couple hundred metres east of metro A station Cordeliers. The area has an interesting history in that much of the area which was sold in the 2000s to private US investors, then to French investors who closed all the shops hoping to attract luxury brands but who unfortunately never came. Now the area – property of Abu Dhabi Investment Authority – is aiming to attract more well known names such as Hard Rock Cafe and Uniqlo from Japan. 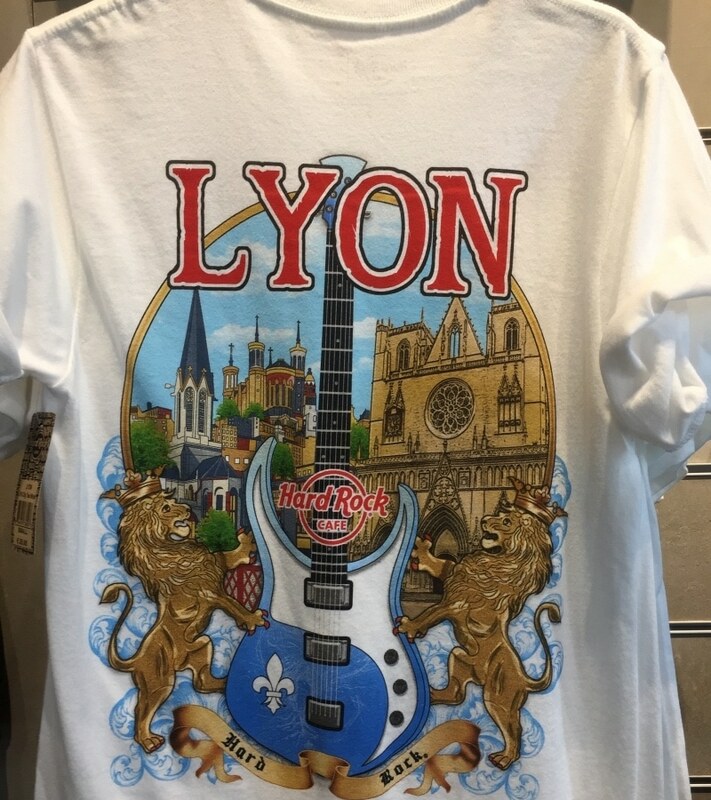 Interesting Hard Rock Café Lyon t-shirt! The bar and restaurant are open everyday from 11:45 am to midnight and Friday and Saturday night it stays open until 2 am. Every Friday from 6pm onwards is Happy Hour “Afterwork” with drinks, DJ’s and live music. If you’re looking for classic American-style cuisine and service with guitars on the wall then Hard Rock Cafe Lyon is for you. It’s a very large and bright place and so naturally more suited to larger groups than for an intimate dining experience.